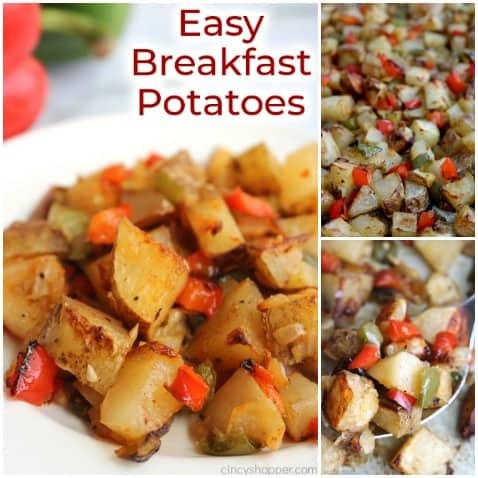 These Easy Breakfast Potatoes will make for a perfect side dish for breakfast, brunch, or even dinner. You will find them packed with flavor with crispy outsides and tender insides, just like your favorite diner. 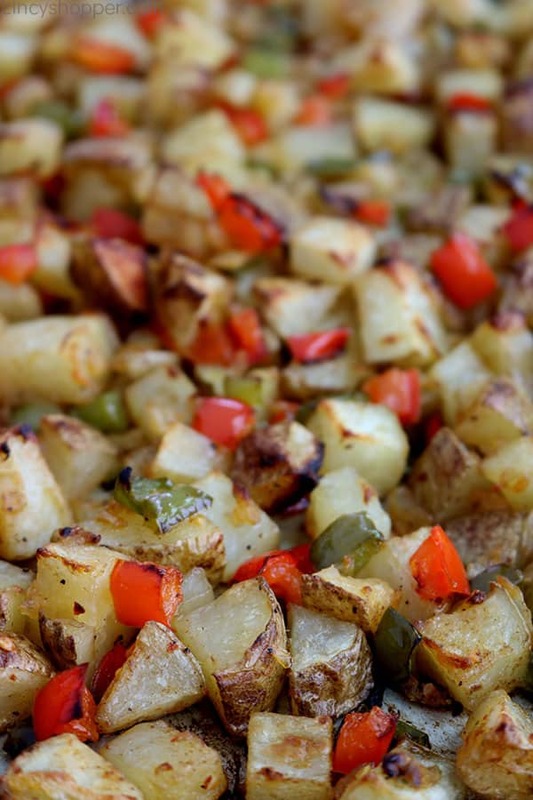 Here is the BEST Breakfast Potato recipe, hands down. I make them for a side with our eggs and pancakes for breakfast, or we frequently have them alongside our Simple Salisbury Steaks or Parmesan Crusted Chicken for dinner. Plus the recipe easily doubles, go ahead and serve them for your next breakfast, dinner, brunch, or holiday gathering. Trust me when I say you will receive many compliments, even from the pickiest of eaters. First, I make these breakfast potatoes in the oven. This method simplifies making a big breakfast. Frying taters on the stovetop is always a task that I never liked. The attention required and the mess made was never a simple task. I have now been making our taters in the oven. I find them to be perfectly seasoned, have crispy outsides, and tender insides. It’s a simple recipe that works. 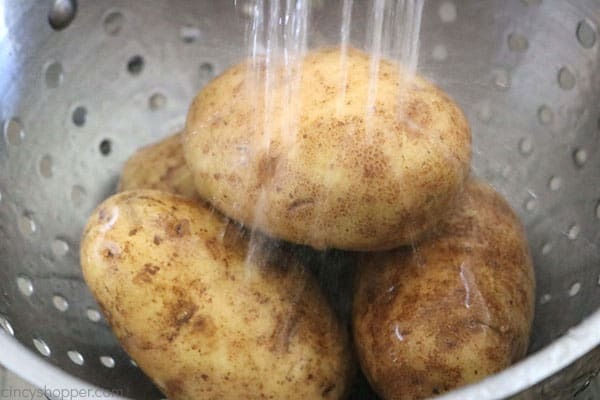 I start with giving my potatoes a good wash and scrub with cold water. I think it works best to wash them and then scrub. 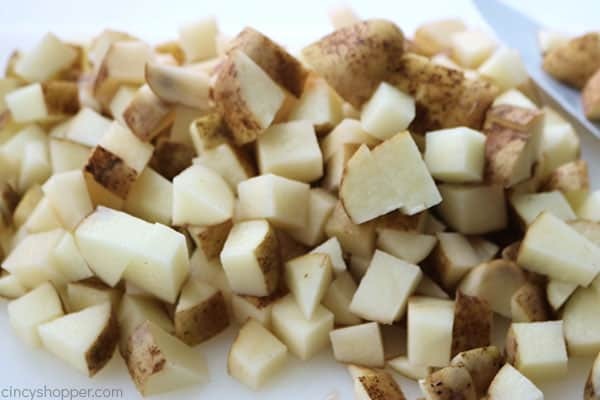 You will want to dice your potatoes into small cubes. I try to keep them about 1/2 -3/4 of an inch in size. Using the smaller dice will result in a more crisp and tender potato. Larger potato sizes will take longer to roast, and the results will not be quite the same. I usually use a whole onion diced. 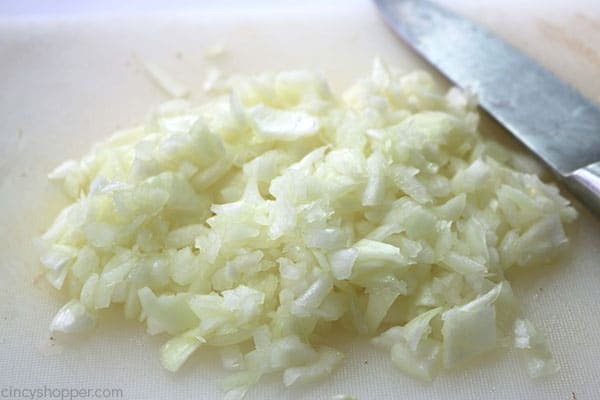 If you are not a big onion fan or you are trying to keep the potatoes kid-friendly feel free to use just a 1/2 of an onion, use a bit of onion salt or omit the onion entirely. 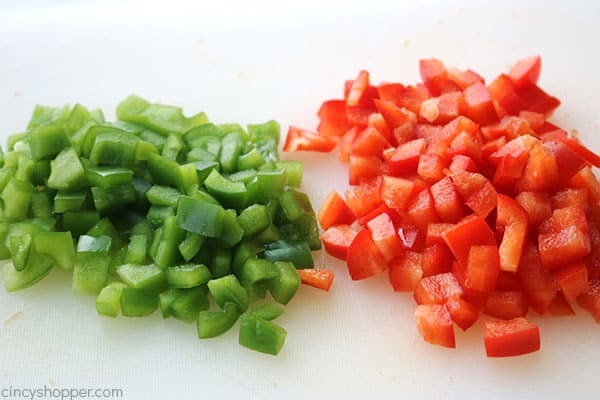 I find that a half of a large green pepper diced to be perfect. I also add in half of a red pepper diced too! 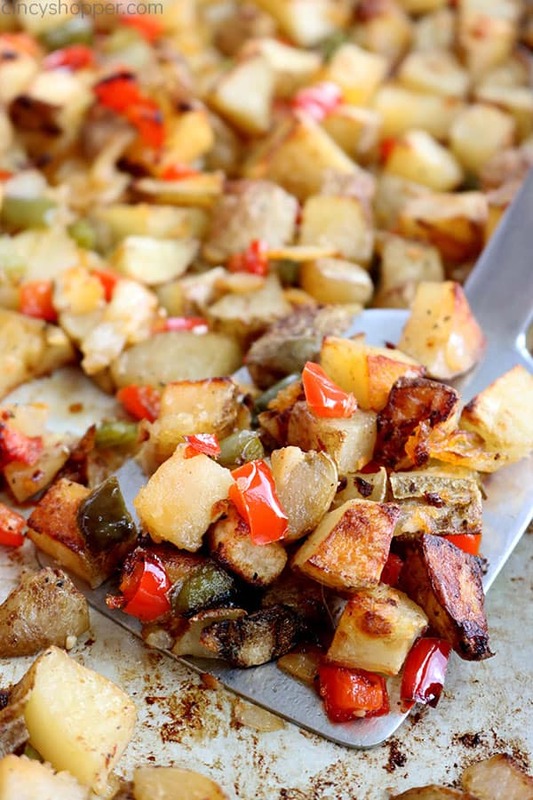 The roasted peppers add the additional flavor and add color. You could additionally throw in some mushrooms if you like. 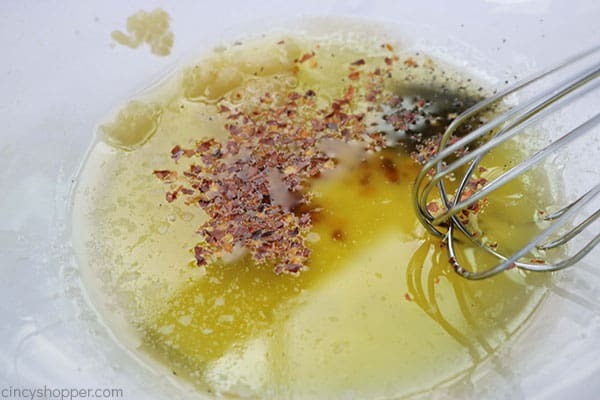 In a large bowl, I whisk together my oil, melted butter, garlic, and spices. Then, I add in the prepared veggies. It’s important to mix everything thoroughly. I make sure that I have coated all of the ingredients well. 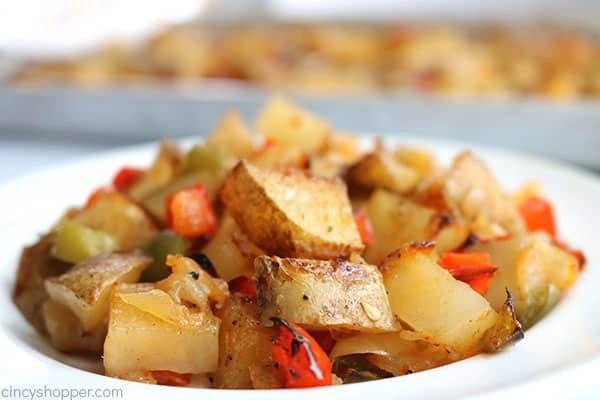 This process allows the potatoes to gain all the flavor and roast evenly. 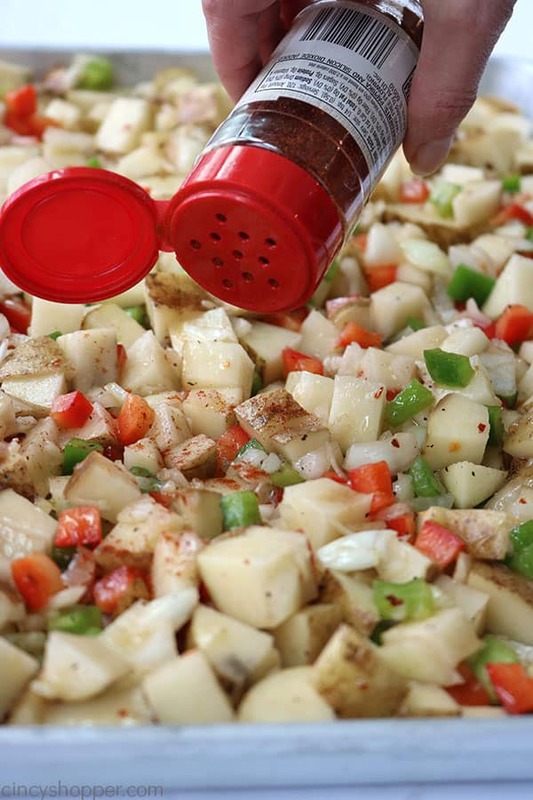 After I pour my potato mixture on to a sheet pan, I sprinkle with a good dose of paprika. The paprika adds a bit of flavor and color. Next, I place the potatoes in a 400-degree oven for around 15 minutes. I turn them and place them back in the oven for another 10 minutes. Pull them out one more time, flip them, and again into the oven at 500 degrees for about 15 minutes to crisp even more. My family likes to enjoy our potatoes with ketchup and hot sauce. 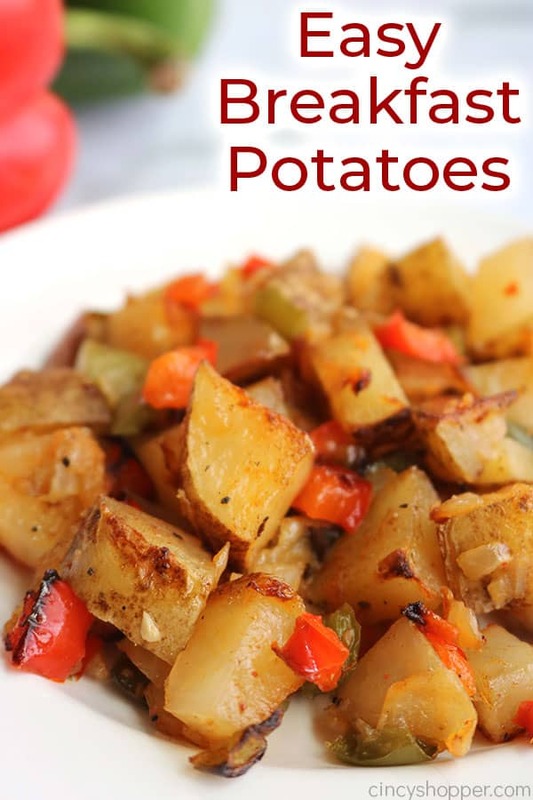 You could add on some sour cream if that is a topping you like with your potatoes. 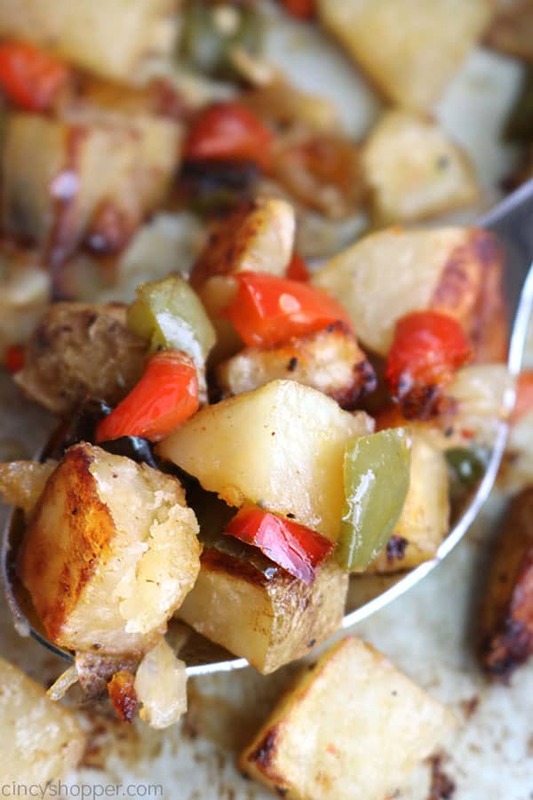 Use a sturdy spatula to loosen your potatoes from the sheet pan. 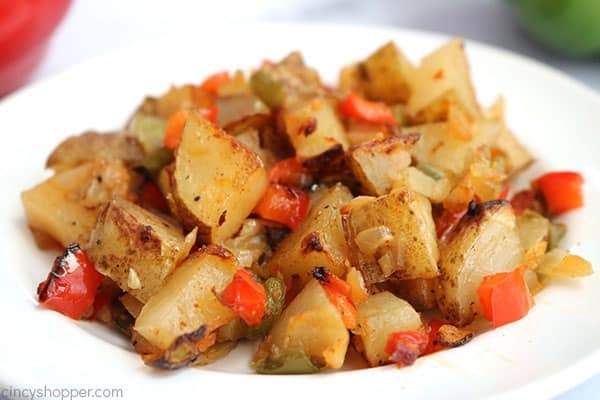 What kind of potato is best for breakfast potatoes? I use a russet most of the time. Red or gold potatoes work too. If you are a fan of sweet potatoes, they are also great with this recipe. 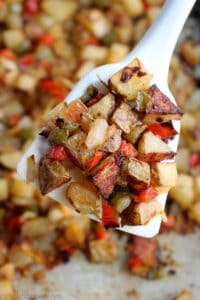 Can I breakfast potatoes be made ahead of time? Sure they can! Go ahead and make them ahead of time and store them covered in the refrigerator. When you are ready to serve, pop them in a 325-degree oven for around 20 minutes. Remove stem and membrane and dice both half peppers. In a large bowl, add oil, butter, garlic, salt, pepper, and crushed red pepper. Whisk to blend. 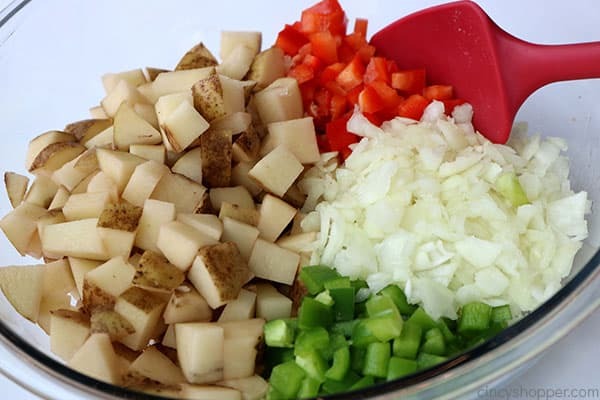 Add diced vegetables to bowl and toss to coat well. Transfer to baking sheet and sprinkle with paprika. Flip mixture again and bake 15 more minutes to brown and crisp. Some will call these home fries, and some will call them fried potatoes. I call them breakfast potatoes. No matter what you call them, you will want to try this easy recipe! I guarantee you will find them delicious. Cracker Barrel Hashbrown Casserole – great for feeding a crowd! 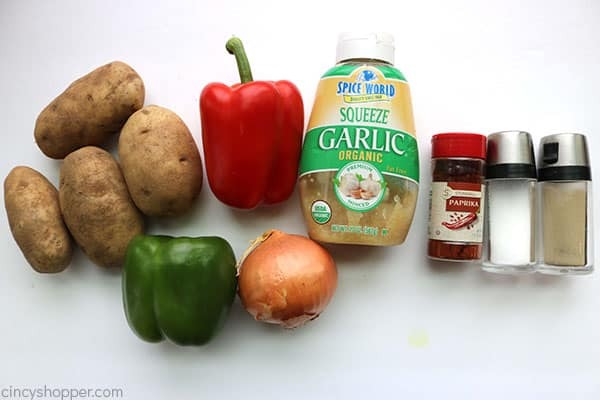 The Best Mashed Potatoes – An easy but perfect recipe. Loaded Mashed Potato Cakes – these are perfect for breakfast, lunch or dinner! 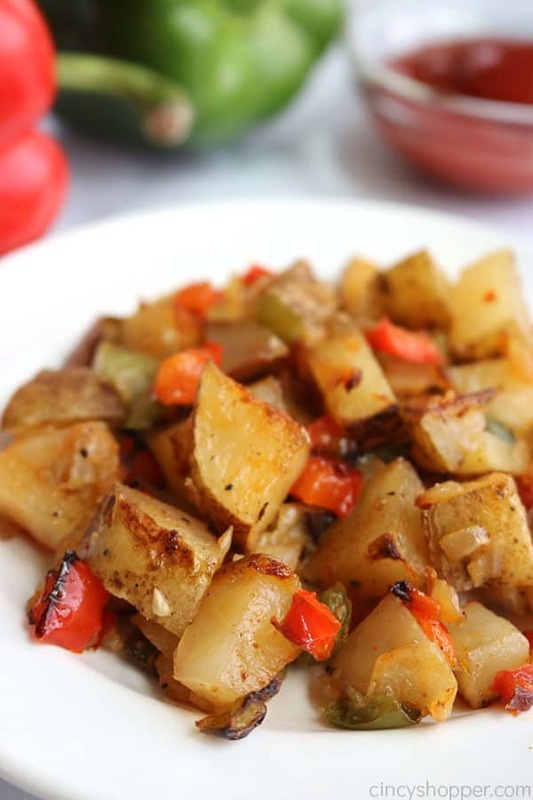 These Easy Breakfast Potatoes will make for a perfect side dish for breakfast, brunch or even dinner. You will find them packed with flavor with crispy outsides and tender insides, just like your favorite diner. In a large bowl, add oil, butter, garlic, salt, pepper and crushed red pepper. Whisk to blend. Use a spatula to flip mixture to other side. These look so good, thank you for sharing!